To understand the different muscle compartments of the thigh and their relative movements. The thigh muscles can be split up into 3 major compartments; anterior, posterior and medial. The anterior compartment contains the Sartorius, Pectineus, Iliopsoas and Quadriceps femoral muscles. This compartment is innervated by the femoral nerve and act to flex the hip or extend the knee. The posterior compartment contains the Semitendinosus, Semimembranosus and Biceps femoris muscles. They are innervated by branches of the sciatic nerve and contribute to extension of the hip and flexion of the knee. The medial compartment contains the Adductor muscles, Obturator externus and Gracilis muscles. These typically adduct the hip and are innervated by the obturator nerve. The muscles of the thigh are responsible for a variety of movements, acting on both the hip and the knee joint. There are loads of muscles in the thigh, however, they can be categorized into the anterior, posterior and medial compartments. The muscles of the anterior compartment of the thigh are innervated by the femoral nerve. Generally speaking, these muscles act to flex the leg at the hip joint and can also act on the knee joint. Fig 1: Muscles of the anterior thigh. Note that the vastus intermedialis tucked underneath the rectus femoris and is, therefore, not visible (Source). This muscle is the longest in the body and runs in an oblique fashion across the anterior thigh. It is long, thin and is the most superficial of the anterior compartment muscles. It runs from the anterior superior iliac spine and runs inferomedially to the medial tibia. It flexes, abducts and laterally rotates the hip joint and flexes the knee joint. This is a flat muscle that runs from the anterior surface of the pelvis to the pectineal line of the femur. It’s placement within the body allows it to flex and adduct the hip joint. This muscle makes up the fourth muscle of quadriceps femoris. It originates from the ilium and attaches to the medial tibia. It flexes the hip and extends the knee. This muscle is a combination of both the psoas major and iliacus muscle, hence the name. They contribute to flexion of the hip joint. Thankfully, the posterior compartment is simpler. Collectively, these muscles are known as the hamstrings and are involved with extension of the hip and flexion of the knee. They are innervated by the sciatic nerve. Fig 2. Posterior compartment (Hamstring) muscles on the left leg (Source). This muscle has two heads. The long head originates at the ischial tuberosity, whilst the short head originates at the posterior tibia. Together, they insert into the head of the fibula. This tendon can be palpated on the lateral aspect of the posterior knee. The long head is innervated by the tibial branch of the sciatic nerve, whilst the short head is innervated by the common fibular branch. It can contribute to some lateral rotation of the hip and the knee in addition to extension of the hip and flexion of the knee. This muscle lies medially to the biceps femoris. It originates from the ischial tuberosity and attaches to the medial tibia. It is primarily responsible for flexion of the knee joint and extension of the hip but can also medially rotate the thigh. It is innervated by the tibial branch of the sciatic nerve. This is the most medial of the posterior muscles. It is deep to the semitendinosus muscle. Like the previous muscles, it also originates from the ischial tuberosity. It attaches to the medial tibial condyle. In addition to extension of the hip and flexion of the knee, it can medially rotate the thigh. These muscles are generally involved in hip adduction. They are innervated by the obturator nerve. Fig 3. Medial compartment of the thigh. Note that the Obturator Externus is not illustrated, but would be deep to pectineus and superior to adductor muscles (Source). Adductor brevis – a short muscle that lies beneath adductor longus. It attaches to the linea aspera on the posterior femur. Adductor longus – a long, fan-shaped muscle that spans the length of the linea aspera. Adductor magnus – the largest muscle in the medial compartment. It is also the most deep of all the medial compartment muscles. 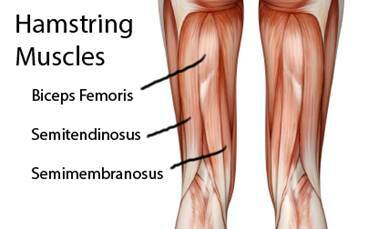 This muscle can be divided into two regions, an adductor region and a hamstring region. The adductor region offers hip flexion whilst the hamstring region contributes to hip extension. Most superior of the medial compartment muscles. Attaches to greater trochanter. In addition to adduction, it also contributes to lateral rotation of the thigh. The most superficial and most medial of the muscles in the medial compartment. It originates from the pubis and descends to the medial surface of the tibia. It, therefore, also contributes to flexion of the knee in addition to hip adduction.